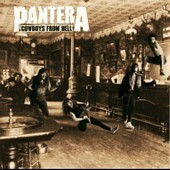 1990 saw PANTERA's first major label debut, COWBOYS FROM HELL, unleashed by ATCO RECORDS. Videos for the singles CEMETARY GATES, COWBOYS FROM HELL, and PSYCHO HOLIDAY were often requested and aired on MTV's HEADBANGERS BALL television show. The band had much success touring as a support act to bands like SUICIDAL TENDENCIES, EXODUS, & JUDAS PRIEST. The band even played at the MOSCOW RUSSIA MONSTERS OF ROCK festival, along with such established bands as AC/DC, METALLICA, and THE BLACK CROWES.